This is Jon. We had a little bit of cabin fever on Sunday morning. Since CWU lost, UW lost, Wazzu lost and the Seahawks were losing, I decided to take a break from football for fear that I was going to go crazy. The girls and I decided to explore. We headed to Lake Cle Elum northwest of the metropolis of Ronald (seriously, about 10 people live there). 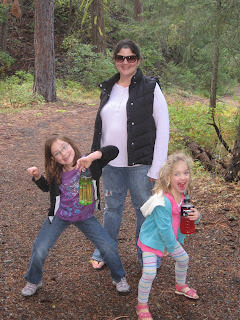 First we went on a hike along the Cle Elum River to see salmon spawning. Unbelievable. If you consider the work a salmon has to put forth to extend their habitat, it's mind boggling. The girls didn't really understand that aspect, but were able to see quite a few salmon (some where pretty big) struggling against the current. At the start of the hike. Obviously the girls were excited with my education-based guided tour. Addy's first day of preschool! This is Jon. As if we needed another example my two princesses continue to grow up too quickly, Adelyn's first day of preschool was Monday (and Delaney's first day as a first grader last week, see below post). Adelyn was hot and cold on the whole thing in the days leading up to the big day. We adjusted our enthusiasm accordingly, sometimes talking about it, sometimes getting excited about it and other times not discussing it at all...which obviously screwed everything up. 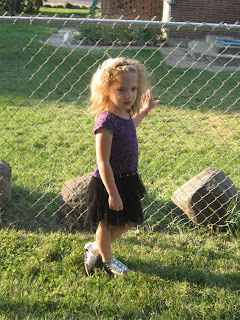 This is the best photo we could get of Adelyn in the front yard before school. She's not much for standing still for photos and definitely had some anxiety about her first day of school. But she looks so cute here. I wish I could say she was so excited to get to school that she ran to the car jumping in and was rip roaring to go. Nope. She basically locked herself in the car to take refuge from her parents and the reality of going to school. This is Jon. I decided that a week's worth of rodeo entertainment in Ellensburg wasn't enough so I headed to Puyallup for a big rodeo there. Throughout the year within the Professional Rodeo Cowboys Association, there is a ProRodeo Tour which designates certain rodeos as "tour" rodeos (Ellensburg is the final tour rodeo of the year) where the money earned on the tour qualifies you for a tour playoff (top 24 in the tour standings) and tour championship (top 12 in the tour standings). The playoff is this weekend in Puyallup. The tour championship is in two weeks in Omaha (I'll probably not make that one). 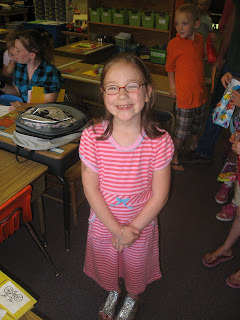 First day of school for our 1st grader, Delaney! This is Jon. 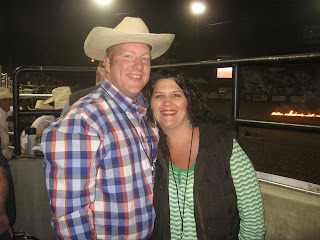 Another Ellensburg Rodeo is in the books (for the 89th time) and like every year there was plenty of action and not much proof (by photos at least) we were there. It's always a favorite and very busy time for both of us. Got to hang out with a lot of friends and favorites over Labor Day. Below are a few pics from the weekend. This was taken Saturday Night at the Xtreme Bulls Championship. This is always a guaranteed sellout (roughly 10,000 people) at the arena. Lots of fire, fireworks, explosions and some crazy bull riding. Fans may notice my new Cinch shirt. I fill it out well, I'm not gonna lie. As you can tell, where Brittany and I set up shop are right next to the roughstock chutes. We get very close to the action. It's a good thing when I say I had a mixture of dirt, manure and drool on me from the action. You can't put a price on that. 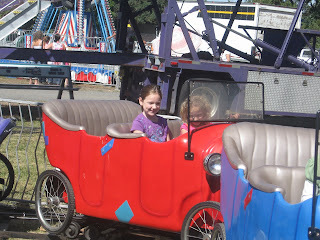 Delaney and Adelyn take their parents to the fair! This is Jon. Today the Guddats made the annual trip to the Kittitas County Fair and we had to be carried out of the place. This year we decided to splurge and buy all day ride wristbands for the girls. We got our money's worth within the first 30 minutes, easy. We ate well, saw so many friends and enjoyed the animals. I of course, went straight to the 4H and FFA barns to compare their produce to mine, more specifically my tomatoes. I think I would have given them a run for their money. I wasn't confident in my tomatoes, so I didn't enter. Rookie mistake. Adelyn drivin' Delaney around in a jalopy. Brittany said this looks like Drivin' Miss Daisy. So for some reason, it took the girls a little bit to get up the courage to go on the rides. We finally got them on the jalopy ride and then Adelyn decided that she was done with it all. She obviously got over her pouting pretty quickly. Delaney was an animal with the slides and rides. Adelyn was, too.